St. Mary's Church01594 530080work ChurchThe ruins of St. Mary's Church are on the hill above the Abbey Hotel and originally served the Parish of Chapel Hill at the southern end of Tintern. The area was included into the neighbouring Parish of Tintern Parva in 1902 although the church remained in use until 1972. The ruins of St. Mary's Church are on the hill above the Abbey Hotel and originally served the Parish of Chapel Hill at the southern end of Tintern. 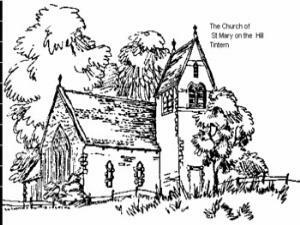 The area was included into the neighbouring Parish of Tintern Parva in 1902 although the church remained in use until 1972. The churchyard is still occasionally used for burials despite the church itself being destroyed by fire in 1977. Local working parties still try to keep the area tidy.